An alliance of new energy automotives was founded Friday in Beijing with the aim of promoting the research and development of the vehicles. 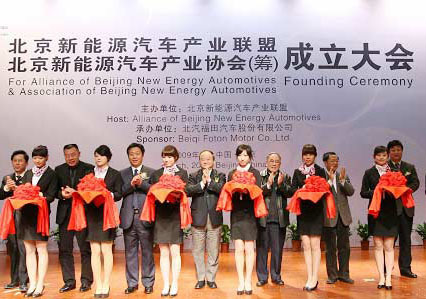 Initiated by groups like the Beijing Automotive Industry Holding Corp, Beijing Bus Group and Beijing Institute of Technology, the Alliance of Beijing New Energy Automotives is a non-profit organization with more than 300 members. The organization is primarily based on the Beijing New Energy Automotive Design and Manufacture Base set up in December last year at Beiqi Foton Motor Co Ltd. The 66-hectare base, with a total investment of 5 billion yuan ($732 million), currently has a production capacity of 5,000 new energy buses and 400,000 highly efficient, energy-saving engines annually. Zhao Jingguang, the alliance's secretary-general and deputy Communist Party chief of Beiqi Foton Motor, said the organization shoulders a great historical mission in contributing to the development of China's new energy automotive industry. 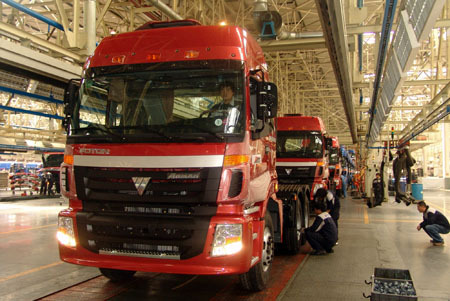 Beiqi Foton's hybrid buses have already started massive production. During the 2008 Beijing Olympics, the company's zero-emission and pollution-free fuel cell buses were also used to improve air quality.